BURLINGTON, Vt. - New Hampshire's Patrick Grasso struck just 4:07 into the first period and the Wildcats kept the Vermont Catamounts off the board to take a 1-0 win on Community Bank Night at Gutterson Fieldhouse on Friday. New Hampshire improves to 11-9-8 overall (7-6-5 HEA) while Vermont falls to 11-14-2 overall (4-11-2 HEA). "We certainly had some great looks as did they. Stef made some great saves and they hit some pipes," head coach Kevin Sneddon said. "We had a lot of opportunities in the latter half of the game: the penalty shot, the power play executed well, and we had other opportunities; we just didn't finish our chances." - Grasso's goal beat Stefanos Lekkas and caromed off the inside of the net and back into the Catamount slot without a whistle. After reviewing the play at the next stoppage, the officials changed the call on the ice to a good goal. Marcus Vela and Brendan van Riemsdyk assisted on Grasso's seventh of the season. - Lekkas (28 saves) stoned van Riemsdyk on a breakaway late in the first period to keep the Catamounts within a goal. - Vermont held a 9-7 advantage in shots in a scoreless second period. Each team had its first power play chance of the game in the second. Vermont's penalty kill held the Wildcats without a shot. - Bryce Misley put a shot past Robinson 28 seconds into the third period, but the official on the ice called UVM for a high-sticking and waved the goal off. A review upheld the call on the ice to preserve the UNH lead. 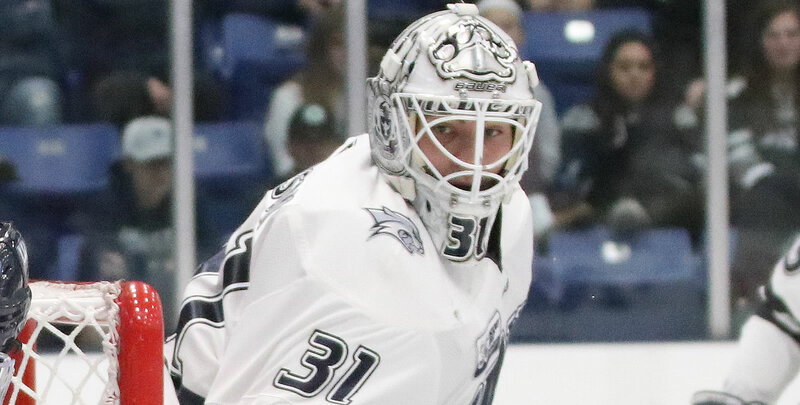 Just over a minute later, Alex Esposito rang iron, hitting the post to the right of UNH goalie Mike Robinson (29 saves). - Sophomore Max Kaufman beat the Wildcat defense and had a breakaway on Robinson with 6:50 remaining in the game. A New Hampshire defenseman snapped Kaufman's stick with a slash and Kaufman was awarded a penalty shot. Robinson stuck with Kaufman on the ensuing chance and preserved the Wildcat lead. - A final push from the Catamounts was stymied when Derek Lodermeier was whistled for a slashing penalty with 17 seconds remaining in the game. - The Vermont penalty kill held the Wildcat power play to zero shots on three chances. Vermont's power play was 0-for-2 on the night with three shots. - Junior captain Matt O'Donnell became the 158th Catamount to play in 100 or more career games. Just over half of all UVM players have reached the milestone. Vermont and New Hampshire close out the 2018-19 regular season series tomorrow night at Gutterson Fieldhouse. Saturday's game is Fan Appreciation Night at the Gut, where fans will have a chance to win several prizes.